The long trek begins for the now annual pilgrimage to the French Riviera for the guys of Cannes in a Van, driving to Cannes…in a…van. What started off as a drunken idea back in 2006 to screen independent short films in Cannes from the back of a van, is now quite possbily one of the highlights of the Festival de Cannes for many locals and visitors alike. Arriving in Cannes for their first festival in 2007, the Cannes in a Van crew certainly generated plenty of buzz, receiving their fair share of media interest, both local and international. They even had a documentary film crew follow them on the trip. Since then, they have built upon their reputation and spread their wings, creating the likes of the Van d’Or Awards, which are now in their third year (and were hosted last year by Barry Norman, no less), and their most recent venture, Swhype, a digital motion design house. 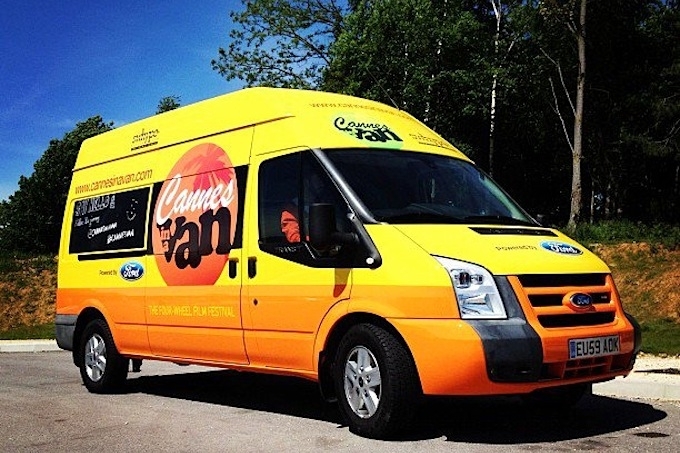 They are constantly looking to expand their ethos through screenings, events and other ideas that will keep Cannes in a Van ahead of the competition. This year, they have a new van, kindly provided by Ford, and will be arriving in Cannes over the next few days. Keep an eye out for them as they make their way though France, heading down south. Cannes in a Van, the ‘four-wheel film festival’ that takes independent film to the heart of the Festival de Cannes and beyond…see you on the Croisette very soon!